I was google searching fall styles the other day and ran across Punky Style. She is a lady after my own heart! “She has a serious addiction to all things vintage, antique and old and odd in general.” What struck me the most was her ability to make a store out of a cute tiny vintage trailer. Isn’t this the cutest idea? How much fun would it be to shop at this mobile store? I love it! Read below for how Punky came up with the idea…. While joking around one night she came up with the idea of selling vintage on the road. At first it seemed a little far-fetched, but never one to let a little challenge hold her back, Punky immediately began scouring eBay and the Want Ads for vintage trailers. 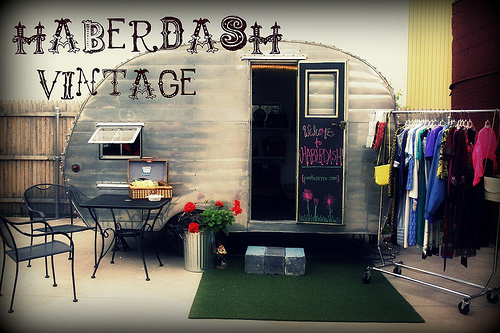 Her 1954 Bellwood trailer became the Haberdash, her traveling vintage shop, and since its grand opening in June it has made its way to numerous markets, fairs, and private parties. Due to such a high demand, Punky has also developed the Haberdash website where fashion junkies near and far will be able to get their hands on her unique finds. This entry was posted in Check this out!, Resale Shops, Thift Stores, vintage on September 21, 2010 by Deanna.